The new offering takes inspiration from the classic TC 2290 Digital Delay Processor. 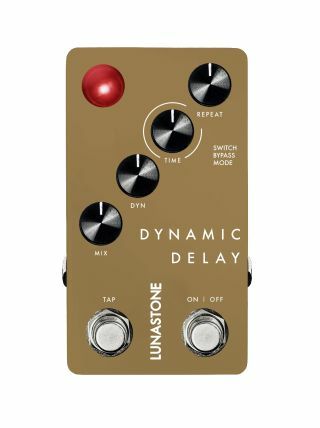 LunaStone has introduced the Dynamic Delay, the Danish effects company’s first digital pedal. The pedal, which was inspired by the Eighties-era TC Electronic 2290 Dynamic Digital Delay, is built around an analog mix circuit to preserve dynamics and gain warmth and softness, but boasts advantages of digital delays, including longer delay time and tap tempo. There’s also a Dynamic Delay function, which has attack, release, depth and threshold parameters merged into one knob, a dedicated tap tempo switch and buffered and true bypass modes for increased tone tail control. Additionally, the diagonal layout of the knobs allows the user to make adjustments with their foot during performance. For more information, head over to LunaStone.com.